Dynastie is a static blog generator. In facts, it's a Django (1.8) application aimed to generate static blogs. I didn't found a solution that fit all these requirements and started to code my own in PHP, but quickly found complex without a framework. Then, I tried Django for the first time and was under the charm : quick and simple. Some people says it's a bad copy or RoR, but I don't care, I write Python not Ruby. Like other static blog generator, Dynastie merge three types of data to produce the website. Posts are stored (in HTML format) in files, while meta information (comments, tags, category..) are stored in a SQLite database (easy, supports SQL queries and portable). Templates are also stored in HTML format. In facts, Dynastie acts like an XSLT processor to produce the output. I wanted to keep close to the HTML/xml philosophy which is the language of the web. As all is a file, you can easily backup your website and export it to another generator. The templates are the most opened as possible : there is a only a few variables to use. It let the user design its website as he wants. The main generated files are indexes for index, tag, categories... and RSS/Atom feeds. All file/directory that do not starts with "_" is copied to the output : no need to specify long lists of files/directories. The best example of all possibilities that offers Dynastie is the output of my own personal blog. It's integrated directly into the sources. Comments are handled dynamically, it regenerates only the commented page, but not the entire website. Be careful, the real "email" field in your form must have "mel" name. If the field with "email" as name is found and is not empty, it's considered as a spamming bot and the comment will not be added. 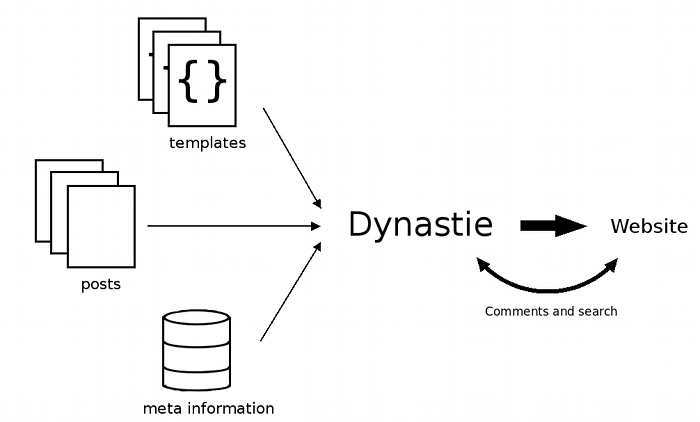 Dynastie (dynasty) stands for DYNAmique STatIquE (dynamic static) : it combines a STATIC blog generator to a DYNAMIC web interface.